You may recall your mother or even your grandmother talking about using the pressure cookers of old, sometimes with unexpected results. A pressure cooker uses steam to cook foods. Available in stovetop or electric models, they both work on the same principle: foods and liquids are placed inside a pot that has a pressurized chamber, and the steam transfers heat to the foods. The pressure builds up inside the pot to cook food at a high temperature, while allowing the food to retain its moisture and nutritional value. When cooking is complete, the steam can be vented using a release valve, before the lid is opened. Recently, pressure cookers have evolved to include many built-in conveniences and safety features that simplify the cooking process. Today, more home cooks are taking advantage of these cooking marvels, not only because they cook foods faster than most conventional methods, but also because they bring out the delicious flavor of foods and preserve inherent nutrients. * Cut foods evenly: Uniform pieces cook most evenly. * Don't overfill: Aim for a pot no more than two-thirds full of food. Be sure to use the recommended amount of liquid called for in the recipe. * Adjust spices: Flavors are more concentrated with this cooking method, so you may want to reduce the amount of spices you use in your favorite recipes. * Brown meats first: For especially tasty pressure-cooked meats, sear and brown the meat before placing it in the pressure cooker to obtain the best flavor and texture. * Secure the lid: Make sure it's properly closed and locked before you begin cooking. * Experiment with recipes you love. Try cooking in incremental stages, starting with the shortest recommended cooking time; you can always cook for a more minutes if needed. * Consult the manufacturer's manual: Read and follow the instructions for the specific model you purchased. The secret to achieving a pleasing and environmentally friendly bathroom renovation is choosing the right combination of fixtures and accessories - and realizing that the bathroom is one room that's well worth investing a bit more in to achieve great upgrades that are modern and lasting. Bathrooms sell homes. An upscale bathroom remodel that costs around $50,000 will recoup more than 58 percent of its original cost at the time of resale, according to Remodeling Magazine's Cost vs. Value Report. A mid-range renovation returns even more on your investment - 65 percent. The bathroom is one room where dollar value also meets aesthetic appeal. Considering how much time Americans spend in the bathroom, and how many of us consider the bath a restful oasis where we can close the door on the 24/7 wired world, it's easy to justify spending a bit more to achieve the bathroom of your dreams. Life - and your morning - begins with water. So how do you create an environmentally friendly bathroom that is good for Mother Nature and your own lifestyle? TOTO product designs are distinctive but adaptable, so they work well with a wide range of styles and architectural expressions. The manufacturer's elegant 11-inch Rain Showerhead uses a water-sipping 1.75 gallons per minute to deliver a luxurious shower experience and appreciable water savings. And its Keane Lavatory Faucet consumes just 1.5 gallons of water per minute, without sacrificing an ounce of performance. TOTO toilets have earned a reputation as the "Sub-zero of the toilet world," according to the New York Times. They perfectly marry exceptional design with EPA WaterSense-level conservation. The UltraMax II 1G toilet uses a single gallon of water per flush to effectively clear the bowl, and offers an elegant, upscale design to enhance any bathroom renovation. When it comes to other design elements in the bathroom, such as flooring and lighting, it's easy to find greener options that are also high-end and visually striking. Finally, improving the electricity efficiency of your bathroom lighting is as simple as replacing incandescent bulbs with energy-sipping LEDs or CFLs. The looks and sizes available in both types of energy-efficient bulbs seems to expand every year, so it's possible to find one that will fit in any light fixture - turning even high-end luxury lights into eco-friendly, energy efficient options. A GREAT LOCATION & BEAUTIFUL SETTING WITH FRUIT TREES! 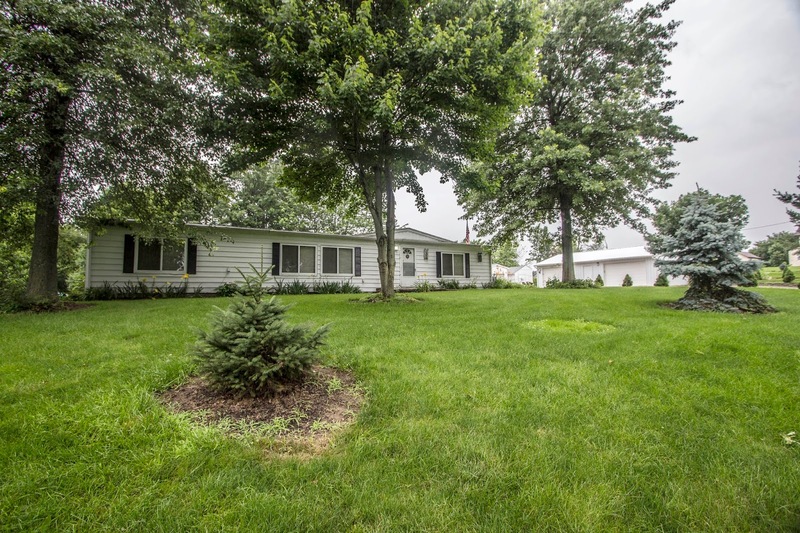 Nearly 2,000 SF Ranch home on a scenic wooded & gently rolling 1+ acre fenced lot. Very spacious remodeled Kitchen. Vaulted Great Room. Master Suite has 2 walk-in closets & private Bath. 1st floor Den/Office. Updates include: roof, gas furnace, A/C, windows, water heater, whole house generator, flooring & more! 3-4 car & 1 car detached garages. 4 BRs & 2 Baths! Southwest Licking Schools! Only $129,900! Call DeLena today!